This site will, over time, turn into a source of information about myself, and a way for me to publicise what I'm doing, and host various projects of my own. Right now, it's more of a placeholder than anything else, although it has a few links and interesting bits of content. New update about Myrddin. This one's a big one. Monthly is too strong a word. I'm calling the Myrddin updates 'Myrddin News'. The Second Myrddin Monthly is out, describing updates to the Myrddin language since the last update. As of Feb 2014, this site is generated using the delightfully simple USSM static site compiler. This means I no longer have to write HTML out by hand, which means I may actually start updating it regularly. The first Myrddin Monthly is out, describing updates to the Myrddin language since mid-December. Thanks to the free time from holiday seasons, it's been a productive month. This is a prank I did in 2007 as part of a successful attempt to get a position as an engineering welcome week representative. I burst into random classrooms to preach from the Bible of Javahova. A video of one such entry can be viewed here, in theora format, or, if your computer will not play that, in xvid format. My personal configuration for vim. 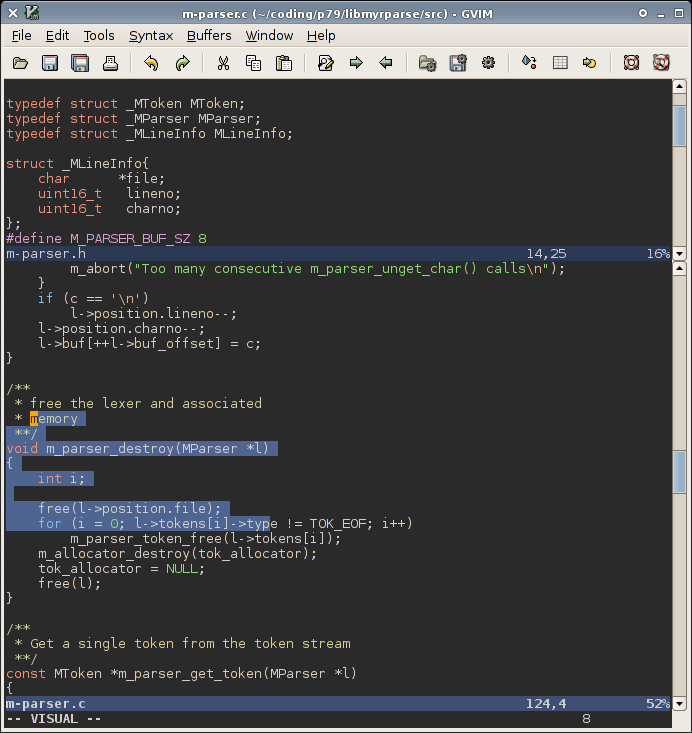 It uses the "Moria" colorscheme for gvim,and the default "Impact" color scheme on the console, with bg=dark set. The Moria theme is mirrored in vim/colors/moria.vim Screenshots are here for Moria and here for Impact. I still haven't found a console theme that I'm satisfied with, sadly. There are also syntax and indentation files for my pet language, Myrddin, in vim/syntax/myr.vim and vim/indent/myr.vim respectively.